The Anti Phishing Working Group reported that in the third quarter of 2009, 48% of the computers scanned for malware were infected with downloaders, password stealers, or other forms of malware. Their report also indicated a 5.5% increase in reports of first time phishing attempts, with an overall decrease in the number of victims. This indicates that cyber criminals are working faster to get new phishing sites online, but those sites are being discovered and neutralized more quickly than ever. The report continues on to indicate that the single greatest problem in the battle against phishing scams is a general lack of awareness among those in the public about how the scams work and how to avoid becoming a victim. These stats aren’t too surprising. Many people who take the time to scan their computer do so because they have a legitimate suspicion of existing infections. Perhaps those same people get counted twice in these stats as they later scan their computer again to double check for threats. 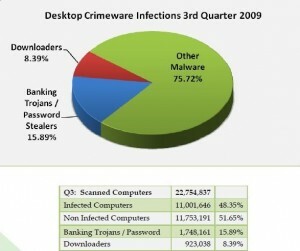 It would be interesting to see what percentage of computers overall is infected. Too many people don’t know enough about computers to even know that they should be protecting themselves against such threats. I never thought there would be an anti-phishing working group. I’m heading over there straight away to go check out what they ahve to say. I think my computers need scanning, just for peace of mind. That’s very disappointing to see that so many people are still susceptible to such attacks. What surprises is me is people keep falling prey to these things repeatedly. A large majority of the phishing attempts are easily transparent and even people that are not too bright should be able to see thru them. But based on the facts, that’s not the case it seems. Mine was and I had endless trouble getting it all cleaned up. Some got onto my blog too and that was the worst part. It is now clean and hopefully, with the protection that I have taken, it should stay that way. It is better to formatt u r computer. Becoz it is difficult to handel 400 virus by any anivirus software. Any how it will leave one or the other. Or it may be tha it may delete ur exe file and u need to format it again. Its really intriguing how these scammers get into our computers despite so many security checks. I have a strong antivirus on my laptop and have noticed that most of the pen drives when inserted on my computer gives a security warning. Wonder how they survive other computers. It would be interesting to see what percentage of computers overall is infected. Too many people don’t know enough about computers to even know that they should be protecting themselves against such threats. I would be interested to know how long these computers were infected. I think a lot of computers get infected by low memory usage viruses and malware that the user has no idea exists. So those computers could remain infected for years. Some people only bother to scan for viruses once they get a more obvious infection that actually affects computer usage. in my opinion this percentage is higher that 48% for internet users. i myself experience some malwares which dont even permit antivirus to run on my system and i found no choice except to format drive c: and reinstall windows. Sometimes it is impossible to avoid infection.